The Sadist is believed to be the first feature film based on real life serial killers Charles Starkweather and Caril Fugate. Mainstream Hollywood would not produce films inspired by the pair until a decade after this one. A number of films were inspired by the duo (some very loosely) and included such major examples as Badlands (1973) and Oliver Stone's Natural Born Killers (1994). I thought everything about this movie worked. The pacing was good and a number of scenes were quite tense. They even managed to make me wince a time or two. I can see how this film paved the way for others of its kind. 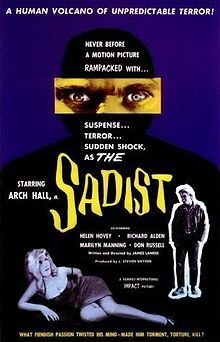 The Sadist is well acted and the scenes were framed very well. The climactic scene where the killer falls into a pit with rattlesnakes is perfect. The look in his eyes mirrors that which we saw in his victims. Nicely done. The film was directed by James Landis [not to be confused with John Landis] who I was surprised did not direct more films than he did. His work here is very competent and shows great potential for more. Arch Hall, Jr who plays the killer channels James Dean with a crazy streak. After watching this film, I had a greater appreciation for the many slasher flicks that would follow. It's hardly Psycho (1960) but it is enjoyable nonetheless.